Greetings, Stampers, and a Marvelous Monday to you! I hope you all had a lovely weekend. Mine blew by in a blur once again. But you know me, I always squeeze in some stamping R&R time. Sometimes I think I'd really go crazy without a little crafty therapy at the end (or beginning) of the day. And it's cheaper than a therapist... well, maybe not... LOL! 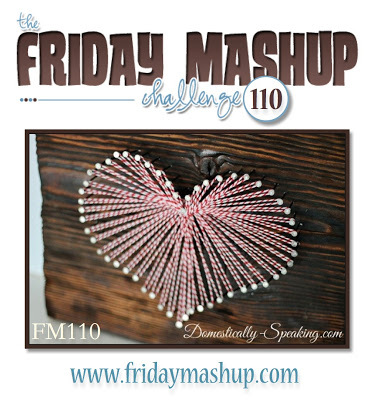 Soo, the challenge I was drawn to first this weekend was the one at Friday Mashup. 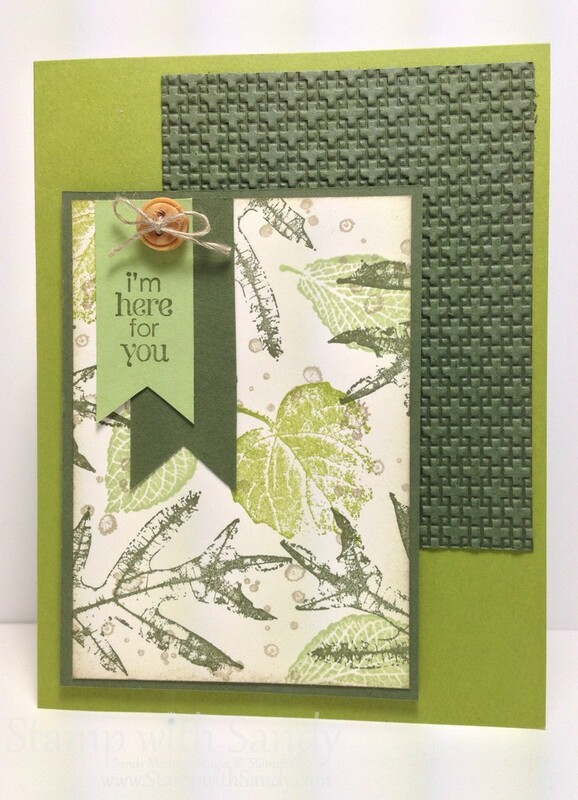 Their challenge this week is to 1.Create a project using a "Monochromatic color scheme" or 2. Create a project "using Baker's Twine" or 3. 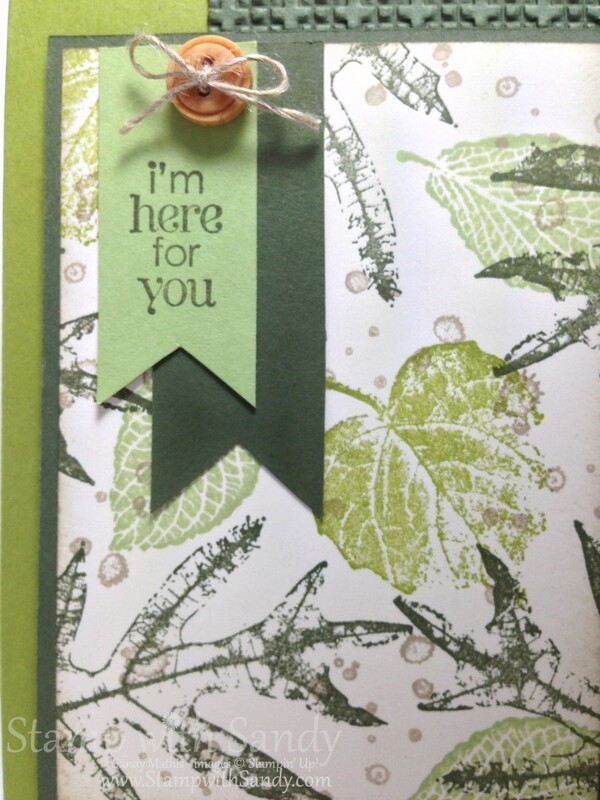 Mash it Up and create a "Monochromatic project using some Baker's Twine". I love these and/or options at Friday Mashup, they really get your brain in gear! 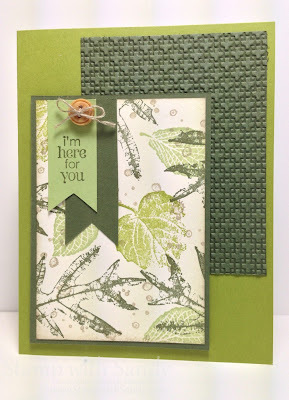 I immediately had a stamp set and color scheme in mind (you can never go wrong with shades of green), and I had intended on using Baker's Twine, too. But once my project was together, the white in the Baker's Twine didn't seem to meld with the Very Vanilla card stock, so I had to substitute Linen Thread. OK, so I didn't Mash it Up this week but I tried! By the way, can somebody please invent some Very Vanilla Baker's Twine? I know, I'm so fussy. 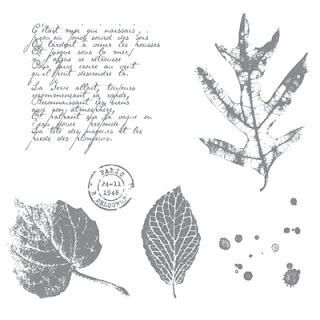 I stamped the images in the French Foliage stamp set in shades of green: Certainly Celery, Lucky Limeade and Always Artichoke. The water spots were stamped in Crumb Cake, and the edges of the Very Vanilla card stock were sponged with Crumb Cake ink, as well. The greeting on the little banner is from the Petite Pairs stamp set. Beautiful layout, and I think linen thread is perfectly fine. You don't see this set in greens very often.. quite refreshing and perfect for this time of year. Thanks for joining the Friday Mashup this week. Those leaves look perfect in monochromatic greens! I love the addition of texture with embossing, as well as the sentiment on the little flag and the sweet button - just fab! Thanks for playing along with the Friday Mashup this week!